What are your research areas? Diagnosing male factor infertility, which accounts for half of all Assisted Reproduction Technologies (ART) procedures in Australia. It is akin to solving a large jigsaw puzzle. Some pieces or answers, like reduced sperm number and motility, are right in front of you but there are other pieces, like genetic differences, that are much smaller in size or even hidden. I study the structure and function of sperm proteomes – these are the entire sets of proteins that are expressed by genomes. About 1 in 15 men are infertile and Medicare-funded statistics point to an IVF success rate of just 22 per cent, which is equally concerning. It's important we develop more efficient and effective ways of finding the best sperm. I am aiming to one day soon diagnose and prognose 80-90% of male infertility cases, whereas at the moment we can probably detect 30%. Some men are missing proteins in the head area, which means they're unable to recognise and bind with the egg, others are missing a protein in the neck area so the head and tail actually fall apart over a period of time. 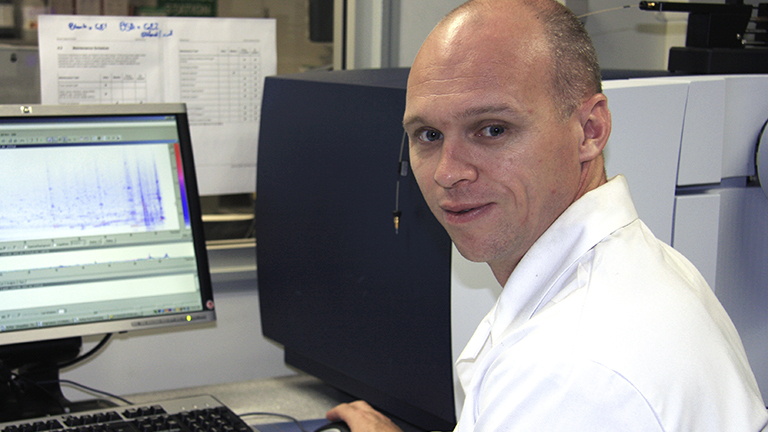 Associate Professor Mark Baker, a pioneer of sperm proteomics, is a University of Newcastle Research Fellow in the Priority Research Centre in Reproductive Science and a member of the HMRI Pregnancy and Reproduction Program. Named the 2011 HMRI Early Career Researcher of the Year, he was awarded a coveted National Health & Medical Research Council Career Development Fellowship in 2012 to use mass spectrometry to illustrate the chemical composition of larger molecules and cells. Associate Professor Baker received a Bachelor of Science with First Class Honours in 1997. He began his research career in the cancer field, undertaking a PhD at Monash University in 1999, principally using it to investigate the relationship between chemotherapy and cell death. Seeking to gain a more intricate understanding of the cell cycle during his three-year probe, he closely observed the mechanism by which microscopic units were dying during the chemotherapy process. Associate Professor Baker relocated to Newcastle after his PhD was conferred in 2002, linking up with Laureate Professor John Aitkin and the University's influential Reproductive Science Group. Inspired by new technologies at the time, the creative collaborator looked to put an unusual twist on his PhD theme. Outcomes from his research will have important implications for both male fertility and infertility and for development of new contraceptives aimed at preventing fertilisation. Associate Professor Baker is a major contributor to developing the first-ever combined spermicide/microbicide capable of providing simultaneous protection against fertility and sexually transmitted diseases. Associate Professor Baker has established a state-of-the art proteomics facility at the University of Newcastle, and recently introduced new comparative peptide analysis technologies, making his facility the only one in Australia with non-labelled technologies. He has an admirable publication record – averaging 6-8 papers each year - and was the first person in the world to publish the entire human sperm proteome and the first to apply new advances in metabolomics to this cell type. Mark’s research has already been cited more than 950 times – an outstanding achievement for an early career researcher. At the same time, Mark is collaborating with neurology expert Dr Neil Spratt on a clinical stroke research project. Again attempting to figure out the "whys" behind the "what is," the duo is seeking to compare the difference between normal cerebral spinal fluid and cerebral spinal fluid that belongs to patients who've had a "minor stroke."